Arterial Cleansing | Slow-Motion Y-DAN Exercise - FOH Inc.
Don't give in, never give up! Regain control over your cardiovascular system. Reduce and/or regress atherosclerotic plaque deposits naturally. The Physical Activity Guidelines for baby boomers - Americans born between 1947 and 1966 - recommend 150 minutes (2.5 hours) of moderate-intensity physical activity or 75 minutes of vigorous-intensity physical activity per week (on average, 2% of the total awake time). It isn't a lot, but it will go a long way to guarantee the quality of life. As the saying goes, a little workout never killed anyone. However, 80% of Americans fail to meet this goal. Today's culture has far removed exercise from any strong connection to our lifestyle. It is no more a matter of day-to-day life when you don't even think about it. In fact, physical inactivity has become pandemic. It is now seen as the '21st century smoking' being responsible for about 10% of cases of premature heart disease. Exercise increases high-density lipoprotein (HDL), the "good" cholesterol. HDL cholesterol acts as a scavenger, pulling bad cholesterol away from arteries. Regular physical activity slows down or even prevents the development of diabetes. Aerobic exercise reduces inflammation in your arteries (inflammation is the reason plaques become unstable and cause blood clots. Exercise "cools off" the cells inside plaques that cause inflammation). Exercise helps you maintain normal weight. Excess weight is a risk factor for heart disease, diabetes, and high blood pressure. Exercise improves fitness and heart health. More than half of all adults in the U.S. do not complete the adequate amount of exercise which is recommended daily (JAMA, Nov. 2007). Here're the recommendations established by American Heart Association and the American College of Sports Medicine (ACSM, serving as a minimum needed to achieve and maintain good health throughout the life stages. One suggests 30 minutes of moderate cardiovascular (aerobic) exercise five days a week. The alternative is a more vigorous cardiovascular exercise for 20 minutes, three days a week. If you need to lose weight, or you are a diabetic, the time spent should be longer than these minimums. Cardiovascular (aerobic) exercise, essential for everybody, is basically any exercise that raises your heart rate, such as walking, jogging, dance, rowing, stair climbing or stepping, biking. It can be performed at any age. When done properly and at the right intensity, it is safe, comfortable and effective in as little as ten to fifteen minutes. However, if you are taking medications for high blood pressure, on a scale of one to 10 (with 10 being the hardest you could exercise) think of exercising at about a five or six for moderate exercise and at about a seven or eight for vigorous exercise. In addition, it is also recommended that all adults under 65 years of age do eight to 10 strength-building exercises (eight to 12 repetitions each) two times a week. In order to know what weight or resistance is appropriate for challenging each muscle group, at the end of the repetitions, you should feel like you could not lift the weight too many more times. Increase the rate that calories are burned. Improve or maintain bone density. Reduce the risk of falling. Reduce high blood pressure, cholesterol and triglycerides. Resistance movement can be effective in even two - three minutes, and can be performed at home or in a backyard with some plain tools like adjustable dumbbells or hand or leg weights. For people older than 65 years of age, the new guidelines suggest the same goals as for those under 65, but they also recommend adding exercises for balance to reduce the risk of falling. When it comes to cardiovascular risk, moderate activity for longer periods is just as good as vigorous exercise for shorter periods of time. It seems that the regularity of the exercise is more important than the intensity. This exercise consistency helps lower triglycerides and increase HDL-"good cholesterol". Always start gradually, especially if you have not been exercising regularly. Establish the habit of exercise first by finding the ways to fit it into your daily routine. Second, increase the time you spend being physically active. If prefer to exercise more vigorously, gradually increase the intensity of your exercise over time. After a break from regular exercise for whatever reason, ease yourself back into the activity. Do not try to resume exercise at the level where you stopped. Exercise safely. Stop, if you experience any acute pain or dizziness. A few little aches are common in the beginning, but after a few weeks, they will disappear. Daily stretching will keep your muscles flexible and help maintain range of motion. Consider a healthy snack about 30-60 minutes before and after exercise. If you have trouble with balance, use some type of support (such as a handrail) and do strength exercises in a seated position. Although exercise is one of the best things you can do for your health, for most people habitual exercise is only a wishful thinking. For many the biggest roadblock is - getting started. Almost 85 percent of deaths caused by atherosclerosis are in people over age 65. After age 65, women quickly catch up to men in the risk from atherosclerosis complications. Many clients in our practice, especially "no-exercisers", have found one particular physical activity beneficial to their cardiovascular health - a gentle, slow-motion Chinese exercise called Y-DAN (meaning "External Elixir"). Low-intensity and not strenuous, Y-DAN produces real health benefits, especially for those who have little or no experience with exercise and find even moderate aerobic exercise unrewarding, even boring! it is suitable for older adults who don't identify themselves as 'exercisers'. The function and the nature of Y-DAN, as a part of another ancient system known as Qigong, is based on the key component of Traditional Chinese Medicine called "Chi," which means the body's energy flow. Blood circulation, vitality, and overall energy are all enhanced with good Chi. When Chi flows well throughout the body disease never takes root. Having said that, one of the best ways to improve Chi is through a proper and safe, physical movement of the blood. That's exactly what Y-DAN is all about! easier to learn and grasp, with only 19 movements (as opposed to 108 Taoist T'ai-Chi movements). As a matter of fact, Y-DAN used to be called the "100 Days Exercise," meaning that you could learn the entire exercise and experience its benefits within 100 days. That's exactly what most of our clients have found out! Y-DAN exercise is separated into two parts. The first part consists of seven movements, which are referred to as "Introduction Movements." They begin with an "Embracing Moon" - the arms lifted over the head, while inhaling, and then slowly lowered, while exhaling. This is an excellent way to begin any exercise. Slow, gentle movements are very relaxing and warming up, especially in the morning. The second part consists of twelve movements, which are referred to as "Core" or "Main Movements." They start with a "Preparation" and consist of circulation-promoting exercises, particularly of the hands and arms. Some of the later movements involve gentle exercises of the shoulders, wrists, legs, and lower back. If the movements are done properly, they will stretch and strengthen every part of your body. They are arranged in such a way that they have both a warming up and cooling down effect, especially beneficial to your cardiovascular system. Y-DAN is the perfect answer for those who want to take up oriental exercises for improved cardiovascular health, but find them difficult to start and keep up because of the complexity and difficulty of those exercises. can be followed throughout your life. Our Y-DAN exercise on DVD, recorded by Christopher Wong - certified fitness trainer and Y-Dan instructor - provides clear, step-by-step 30-minute instructions on the 19 movements and can be easily followed by anyone. from our Philadelphia, PA warehouse by U.S. Postal Service (USPS). Although the nutritional arterial cleansing is an effective complementary therapy for promoting cardiovascular health and healing, it is not a replacement for conventional medical treatment. 1. 705. 304. 6246 (US/Can) Monday, Wednesday, Friday: 11:00 am - 3:00 pm EST (Holidays Excluded). If there is nobody available to take your call, kindly click here to email us. We will get back to you next business day. Thermography: a photographic technique that measures and records infrared heat patterns. It can be used to detect areas of poor circulation in the body. Plethysmography: a technique used to measure blood flow volume in the body. In atherosclerotic disease, the vigour of the blood flow may be seriously decreased. 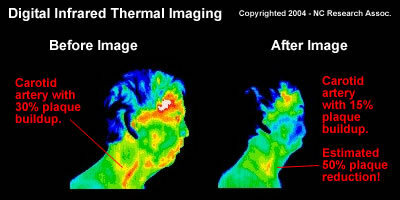 The following picture shows a high-tech digital infrared thermal imaging of a carotid artery of a man before and after the nutritional arterial cleansing. Who says then that the nutritional arterial cleansing does not work? Those, who think that micronutrients, vitamins and anti-oxidants are not necessary for our health and that optimum nutrition is not important. Why do they think and act that way? Because they don't want to learn and just keep ignoring the impressive results - not only heard about, but also seen and experienced by people who have undergone the nutritional arterial cleansing. The facts speak for themselves. No matter how hard you try, you can't ignore them. The micronutritional artery cleanse is not a pie-in-the-sky concept. It is for real and it does work. For a lot of people. A change in diet and, eventually, in lifestyle is not an easy task, especially for those who have little time for meals. The majority of people still remain confused about the most effective way to protect their cardiovascular health. As a matter of fact, we all can't seem to adapt ourselves to all those "dietary and lifestyle plans" for the long haul. We all seem to wait for the Holy Grail of diet and lifestyle to be found. Definitely, when it comes to atherosclerosis, foods have a direct impact on the quality of our blood vessels. We all know perfectly well, for example, that what we eat does affect the blood lipids, and that we do not need new cholesterol-lowering drugs to keep the cardiovascular system healthy. Therefore, the first line of any treatment - medical or alternative - should always be a change in our diet and, eventually, lifestyle. But deciding which "diet" to choose is not an easy task. But if you really want to eat to control atherosclerosis you need to answer yourself the following question: "What Am I Going To Eat?" Arterial Cleansing: What About Fish? Fish, especially fatty fish, such as mackerel, lake trout, herring, sardines, albacore tuna and salmon, are the main predominant source of omega-3 oils - the essential fatty acids, so named because without them we die. DHA - short for docosahexaenoic (DOE-coe-suh-hex-uh-noy-ick) acid. Unfortunately, it is estimated that over 85 percent of people in the Western world are... deficient in beneficial omega-3 oils. Don't give in, don't give up! As contrary to standard medicine, atherosclerotic processes in the cardiovascular system can be halted and/or reversed nutritionally, arterial cleansing can be of great benefit to you. You can win this battle and you can get well again. What sets it apart from conventional medical methods is that the nutritional arterial cleansing - by keeping atherosclerotic plaques in solution - helps to wash them away safely and gradually. In other words, the nutritional method does NOT pull away "chunks of plaque" that could plug up the arteries further downstream! Because, by definition, dietary supplements nourish and heal (never destruct!) - a characteristic which is not true for any medicine. It's no wonder, then, the nutritional arterial cleansing helps make the plaques disappear and, at the same time, prevents formation of new atheromas. That's how the body functions and works - by nourishing and healing itself in order to maintain homeostasis and prevent any damage to it. So if you or a loved one is dealing with this atherosclerosis, it certainly can't hurt to add therapeutic levels of cardioprotective nutrients to your daily regimen. better skin tone, resulting in a younger look. The nutritional arterial cleansing - believe it or not! - can even help you improve your functional age (not the same as chronological age!) by adding more active years to your life. mesentric ischemia (inadequate blood supply to the small intestine). The nutritional arterial cleansing can complement or - in some cases - even replace the invtravenous (IV) chelation therapy. It may also help cut your dependence on medications such as anti-cholesterol drugs, aspirin, blood thinners, diuretics, nitroglycerin, etc. The nutritional arterial cleansing can also help rejuvenate arteries and prevent their premature aging. As the joy of life depends on a sound cardiovascular system, with the arterial cleansing formula and its long list of health benefits you have nothing to lose - and your arterial health to gain. Who says, then, that the nutritional arterial cleansing does not work? Those, who think that micronutrients, vitamins and anti-oxidants are not necessary for our health and that optimum nutrition is not important. Are you still wondering whether or not it can help you achieve the healthy life you so richly deserve? Or maybe you're just making excuses and waiting for somebody to hand your arterial health over to you. If so, it's not going to happen. You've got to do it yourself by taking responsibility for your own health. If not, you may fall victim to the cariodvascular diseases that are taking so many lives away from so many people, even at the very moment you are reading this website. In other words, if you allow your body to succumb to atherosclerosis, you will greatly increase your chances of getting a heart attack, stroke, vascular dementia, or peripheral artery disease. But if you explore with an open mind and heart the concept of nutritional arterial cleansing and apply it effectively in your life, it might help you - not absolutely but with a very high order of probability - to prevent, fight and reverse the inevitable effects of this ruthless killer. It's not quite true that allopathic (drug) medicine is the only way to get well. It's just a myth, a moneymaking illusion created and constantly reinforced by the pharmaceutical industry and medical establishment. This popularly accepted myth, then, must be debunked and brought to an end. With CLAREVASA, we strongly believe that you can help to make it happen! Don't give in, don't give up. 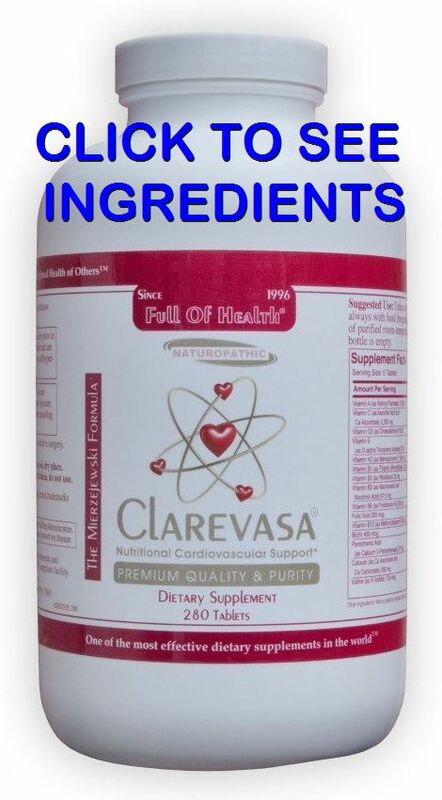 Order your CLAREVASA today! © 1998-2018 Reverse Atherosclerosis.com: Arterial Cleansing | Clarevasa Formula. Unclog Your Arteries Withut Surgery. All rights reserved worldwide. This document may not be copied in part or full without express written permission from the publisher. The information on reversing atherosclerosis nutritionally provided herein is a general overview on this topic and may not apply to everyone, therefore, it should not be used for diagnosis or treatment of any medical condition. While reasonable effort has been made to ensure the accuracy of the information on the nutritional arterial cleansing, Full of Health Inc. assumes no responsibility for errors or omissions, or for damages resulting from use of the information herein.